“If, as Dr. Martin Luther King Jr. said, a ‘budget is a moral document,’ then [the president’s] budget is a reflection of the moralities of the boardroom—the eviction notice, the emergency ward, and the pink slip.” So wrote James Tracy and Gordon Mantler in a Shelterforce post on March 23. Amazingly, the Freedom Budget projected that the housing crisis could be completely resolved within a decade. That may sound pie-in-the-sky as we struggle to hold on to even inadequate programs we have in the face of constant assaults in Washington, but it’s also important to hold on to goals like that. Any successful resistance needs a vision to offer people, not just a critique. We need to keep talking about a world of opportunity, fairness, dignity, security, equity, and community. We need stories and plans that give everyone a sense that there could be a place for them in an inclusive America. Our aim needs to be high enough that when we compromise at all, it’s for something meaningful and joyous, not merely the avoidance of utter ruin. And to do that, we need the big picture ideas and stories, we need courage and boldness, and we need practical know-how. We must have a clear-eyed and honest look at what we need and what we’re advocating for. Crafting practical policies to back up our vision requires that we be thoughtful about all of the pieces, alert for unintended consequences, and willing to question received wisdom and admit mistakes. 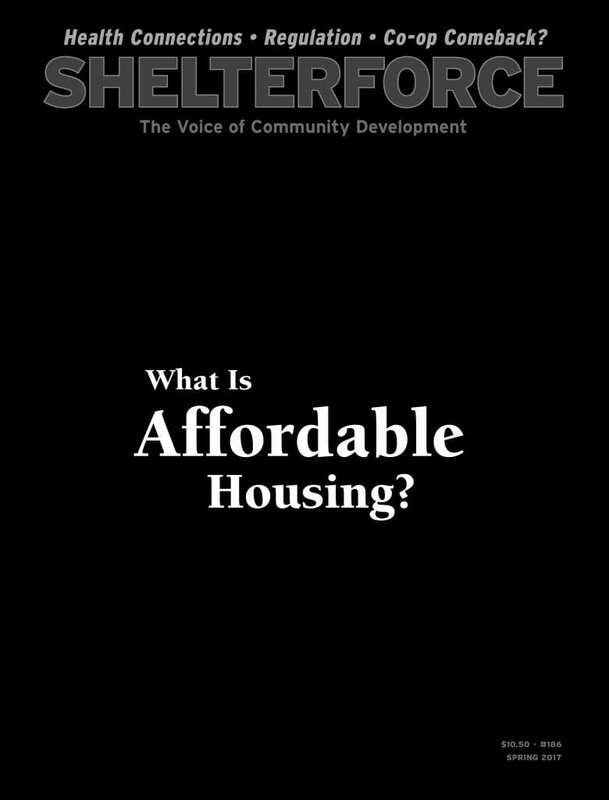 And so in this issue we talk about something that comes up daily for many people working in the community development field—what does housing affordability mean? We bring in the history, the challenges, the different contexts, and the many ways to define what having “enough” means to provide a comprehensive look at this fundamental question. In that spirit, we delve into some of that received wisdom—why do we measure housing affordability the way we do, and does it make sense? How do we define who is “low income” and what counts as having “enough” income to meet your basic needs? Is “naturally occurring affordable housing” really natural, and if not, what should we do about it? In a fascinating roundtable, we also take an in-depth look at an issue where the responses tend not to fit neatly into traditional political pigeonholes—building regulations, such as zoning and codes, and how they affect housing affordability and the ability to create inclusive communities. Following up on what has been a lively conversation on our blog about the roles of supply and demand, market forces, and moderate-income housing, our participants remind us that regulation itself isn’t good or bad, but rather there are regulations whose tradeoffs are more or less acceptable. In the spirit of resistance, Chris Estes of the National Housing Conference reminds us of one crucial component of organizing to defend our own programs—don’t fall into criticizing other programs to make the case. While Estes is speaking specifically about housing programs, the same goes for cross-sector advocacy. Certainly it is both a losing game and a shooting ourselves in the foot even if it were possible to argue that housing and community development is more important than saving health care or clean air. Instead, the community development field can join in a broader chorus, showing how our work is one crucial part of what it means to have a decent, just society. And as many people have said, we should double down on local agendas, even while chaos reigns at the federal level. Last November several initiatives to fund housing passed in the Bay Area—our Organize! column shows how organizing among the residents of affordable housing made it happen. Do you register your residents to vote? We are also pleased to announce the beginning of Shelterforce’s Health and Communities Desk, through which we will increase our coverage of that all-important intersection. In this issue we explore how one clinic is improving health outcomes by helping its patients address legal housing and related needs and how bringing mental health awareness—particularly knowledge about how trauma affects people—into a community organization can make better outcomes for everyone. With initial support from the Kresge Foundation and the Robert Wood Johnson Foundation, we’ll be having even more on this topic in the months to come, both online and in print. One answer to the question of why conservatives do so well politically with people whose policies they arguably harm is that American voters vote for values rather than policy specifics and that conservatives are better speaking the language of values. Another is that arousing negative emotions motivates better in our society of scarcity and up against them tribalism than arousing positive ones does, particularly when we engage in what is perceived as elitist and exclusionary tribalism ourselves. Finally people must have a vision that is worth whatever sacrifices are required or they will drop out emotionally and either participate in negativity or tolerate it. Thus talking about a world of opportunity, fairness, dignity, security, equity, and community, with both stories and data that give everyone a sense that there could be a place for them in an inclusive America, are exceptionally important. Given the role of money-raising in defining the political agenda and options that are on the table, and that the values mentioned do not necessary provide financial returns to those investing in the political process, this is a daunting task. However opportunity, fairness, dignity, security, equity, and community have broad appeal if taken seriously, certainly more broad appeal than they have showed recently. The challenge may be in providing a trustworthy way of achieving them. As a Client Services Manager, we provide permanent housing to individuals with multiple barriers in obtaining stable housing. It is a blessing and humbling service within our community to provide sound and stable homes, but to help families rebuild through Financial Wellness. Articles like this, will continue to educate, enlighten, and encourage this journey the more!